Since coming home for summer I've been doing my best to get back into the routine of working out daily. 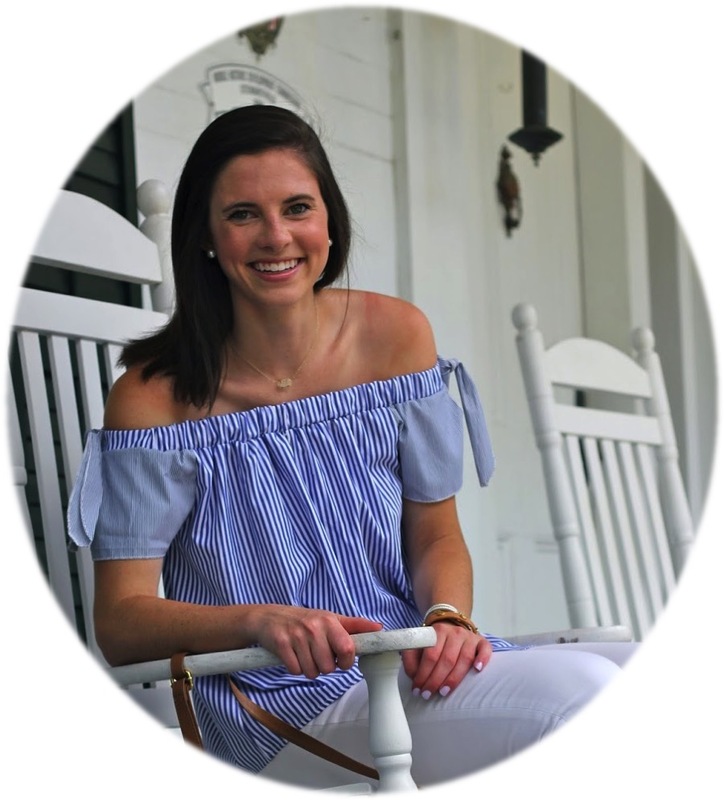 This past semester I was pretty good about that having found a workout class I love that simultaneously gets me off campus away from my phone and constant unread emails in my inbox (I know other sorority presidents can attest to that). Unfortunately, there isn't a barre3 in my hometown so I've been alternating between running and Pure Barre classes to fill that void. At school I'd often rush back to my apartment after spending some time in the library in order to be dressed and ready to head to barre3 in time for the afternoon class. 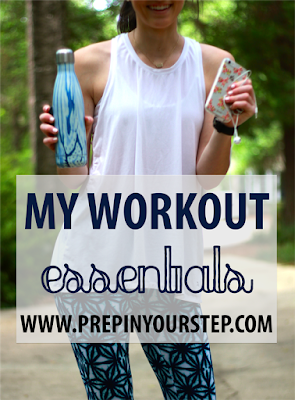 Because I am used to getting ready to workout in a hurry I have since established some of my workout essentials and thought it could be fun to share them with y'all. Although these essentials are for running or barre classes I am sure that they would also prove to be useful for other workouts as well and these leggings are sure to comfort you during just about any activity (even if that includes lounging). 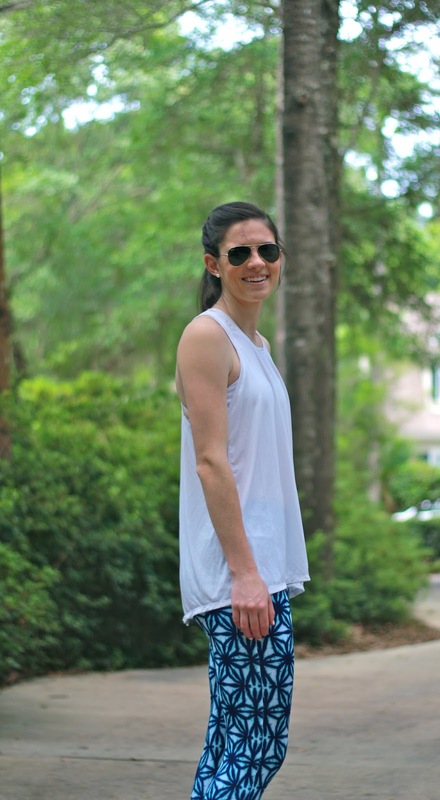 Although when I am running at home it is far too hot for workout leggings whenever I go to indoor workout classes I love throwing on a pair of colorful or printed leggings to make the idea of exercise seem even more inviting. All for Color, one of my favorite lifestyle brands as of late, recently launched the cutest Activewear line that includes perfectly colorful and printed pieces that are equally as comfortable. The fabric isn't too thick which is especially ideal and the breathability also allows it to make sure that sweat doesn't stick. While I am all for a colorful top tried and true basics are the easiest choice in a hurry. 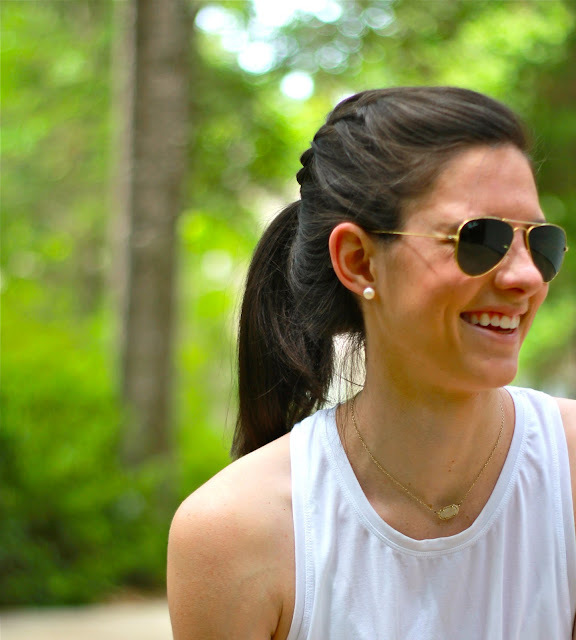 I don't think that you can own enough white tanks and I definitely prefer looks flowy ones as opposed to tighter options when it comes to summer workouts. 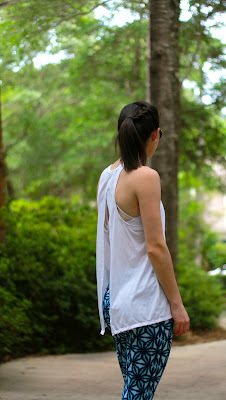 This one is from Gap and Lululemon recently released a super similar one. The open back makes it breezy and the white color will match just about everything whether you're wearing nike shorts or excessively colorful leggings. Obviously a good pair of workout shoes are essential! I am guilty of finding a style I love (if you've never been fitted for a good pair it's a game changer) and buying it year after year. That's what I've done with this pair, I even think that I've had this same color combination for two years in a row. A bit of a strange essential, I know but a braided ponytail is my signature in the summer. When I was a camp counselor my campers would ask me to do their hair the same way and tell other counselors that they want the same as Dorothy when referring to this hair style. This hairstyle is guaranteed to keep my hair out of my face all day and provides a bit of variety from just a normal ponytail. Properly hydrating definitely makes a workout a bit more bearable. I have LOVED my s'well bottle especially since it keeps water cold for an extended period of time. I have the smaller size since that was all that was offered in the print I have at the time but if you're looking for a larger size Nordstrom has a great selection. I use my phone to play music while I workout usually jumping around from Spotify playlists. I know a lot of people don't like the headphones that come with iPhones but those happen to be my favorites! This isn't necessarily an essential for everyone but since receiving my fitbit for Christmas I have loved using it to track my activity. If you've considered getting one or want an accountability buddy as the summer begins I can't recommend them enough! So there you have it, my workout essentials! I'd love to know what your workout essentials are and if any of ours overlap! Also, All for Color has offered Prep In Your Step readers a 20% discount with free shipping on orders over $50 with the code PREPINSTEP. Shop away! These leggings are adorable! Also headphones are a must for me when I workout, I swear music is the main reason why I love working out so much. love this! I'd love to see the playlists you use on Spotify, it's so hard to find one that keeps a constant beat! Those leggings are adorable and I want that same exact water bottle! Is it worth the money though? I haven't heard many reviews about Swell and am curious about your thoughts on it and if you think they're worth it. Definitely agree! I love mine, definitely the favorite of all the water bottles I own! You won't regret it! I love that idea! I'll add that to my list of posts to do this summer. If you have a barre 3 I highly recommend you check it out, it's the best!